EXTREMELY POPULAR & CURRENTLY SOLD OUT.! BUT MORE ARE COMING, PLEASE CHECK BACK DURING JANUARY New for 2018, with all the current dangers & mayhem going on throughout the open door policy of the E.U, & the U.K (& others) wanting to leave the unelected bureaucrat dictatorship - but with a corrupt government keeping us in (in all but name), added to the unsustainable debt being imposed on all E.U citizens through E.U membership bills & central banking debt, the unique personalities that have shaped our fellow European people & countries is being stripped away & whitewashed over as we head into a Police state & fascist dictatorship. So we say lets get rid of the governments & central banks & call for some "Anarchy in the E.U" ! The true meaning of which is written on the back print, you'll have to buy one if you want to see it.! 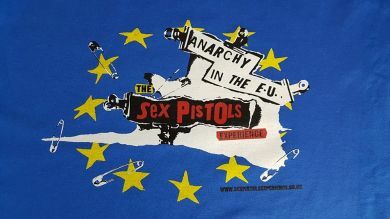 Its not just 'Anarchy in the U.K' anymore, these days its spread further to "Anarchy in the E.U"
if your outside the u.k please add £3.00 to your paypal checkout to ocver international postage/shipping - thanks.